The Government blocked access to several social media platforms including Facebook. Viber and WhatsApp after violence broke out in Digana and Teldeniya. Repeated requests for a lifting of restrictions from local and diplomatic quarters fell on deaf years Viber and WhatsApp were ‘freed’, Facebook access was restored this afternoon. This is colonil mentality of HRC of Srilanka. they don’t have a mind to think for they themselves. Even HIndians and chinese are not this cheap. why don’t you have a mind to keep your mouth shut when there is visible threat to the peace and security because of social media. why don’t you can not understand the reality. this is simply politicization because of Weak mentality. Just bend to any one. I think you were just protecting your job at the expense of the reality abnd the justice. Is this hate speak or not. This is the exact message that was spread by Facebook, and responsible for anti Muslim sentiment. You underestimate and humiliate sri lankan people saying they are just stupid and cannot understand anything in it’s [erspective. How many times Sinhala peole have behaved stupid when Tamils killed sinhala or forces people. Why do you unde estiamte. Why don’t you talk about Rapes of women, MMDA. I heard rapes are very common in Sri lankan and abortions are happening in 100s every day. Are you talking only about politically sensitive human rigths. that foreign embsassies would barge into the talk. Last government denied all forms of freedoms and responded with live bullets on protesters where was this human rights commission, most probably hiding under a rock for their own safety. There could be many things wrong with this government but one thing it has done is respected freedom of information. The same people that denied access to information are now trying to abuse this PRIVILEGE for to create disharmony among communities. This is a temporary required restriction for the benefit and well being of society, so don’t get your nickers in a knot for the sake of getting it. Everyone is entitled to human rights not the selected few that has the power and influence. The move to ban so called “Hate Speech” is a move to silence the citizens and deprive them of their freedom of speech and to be critical of the government or speak up against these Sinhala Buddhist Terrorists! We don’t need a ban on hate speech if all these terrorists were arrested and prosecuted! Even with ample photographic/video evidence little to no action has been taken against these terrorists monks!? We need to get rid of the main culprit “SIRISENA” who has got his popularity dropped from 6200000 to just 62000 over the past 3 years due to his authoritarian and inefficient way of ruling the country. Accept that silencing citizens through this hate speech theory is unreasonable. Some times truth comes up with a bit of anger & hatred (not justifying) but as we are civilized human beings we must be able to contain our minds & try to understand other’s feelings thus not to resort to violence. You’ve gone too far to find Sinhala Buddhists Terrorists in this country. There’re vandals in any community & police must be able to control their behavior as early as possible. Sad that some monks are also among vandals to jeopardize peace. Please try to find the difference between vandalism & terrorism without being rude to find silly satisfaction by calling Sinhala Buddhists, terrorists. As you said banning hate speech is against freedom of speech. It’s the application of law, especially by the police @ right time, right place, in the right way that matters in maintaining peace. It looks like there is a very well planned war against Sinhala buddhist talking. I heard Protestants are at the fore front,. If we talk against there circus. they say ” don’t we have any rights in Here”.The local elelction is over, now they are getting ready for PResidential elelction. the first step is ask buddhists to shut the mouth first .Itis bullying. they call it reconciliation and human rights for minorities..70% of democratic votes over ride reconiliation and human rioghts blah …blah.. If hate speech is implemented to the letter, the first casualty will be Mahawamsa and the second casualty will be Koran, as both are instigating the followers to violence on others. Dr. Gnana Sankaralingam: OK, as a typical racist, you found Quran to blame Muslims and Mahavamsa to blame the Sinhalese. Please educate us what to blame for your caste system related violence and degrading humanity at birth? Shooting the messenger or taking painkiller without curing the root cause approach. Yes, this time we got relief from the pain temporarily with side effect such as this article says. On the other hand, racism in Sri Lanka is cancer that prevents us moving forward, and wasn’t untreated in its early stages for political gains – Now we’re just living with it on painkillers. This is the only one bold decision MY3 (Perhaps, he did not realize it) has ever taken during his presidency, and it is commendable. It helped stop spreading the violence and might have made social media giant, Facebook realize the seriousness of applying its regulations to a language that is spoken by tiny population of the world. Whatever, it was the right move when more effective measures are absent.. In the mean time ministers of the confused – Orumiththa govt continue to fool Voters. Rajitha Senarathne says he controlled or reduced the prices of diabetis meter and Strips. the truth should be those meter patents are over as the product is five years old. Because of that so many manufacturers would send new meters to the market. So, those who had the established market have reduced prices by 50%. Otherwise, it is not the govt action. What Rajitha Senarathne says is a lie. In tghe west, Earlier it was about Rs 10,000 and now it is Rs 5000 would be the prices. In here, the meter is free of charge once 100 strips are bought bought for $43 Cdn. there are products cheaper. It looks in Srilanka it is another FRAUD. UN is too weak , if you can, try and get these fake monks arrested for hate speech ASAP. Personally, I would be happier if Facebook, a social media without a clear purpose is banned forever. It is a productivity killer product in the developing countries with more disadvantages against its very little advantages compared to other social media platforms like Youtube, Linkedin, Twitter. FB does help some business segments like travel and hospitality etc., but that does not suffice its existence as leading social media. Well done HRC and Madam Dr. Udugama. For now., its hilarious and not practical at all when the machine learning Artificial Intelligence Bots are at work for example Sinhala to English which gives some wayward contents. If Sirisena wants to stop 100% hate speech in a more proactive way., he probably need to consider at least 1000 monkeys with Sinahala/Tamil/English knowledfe with computers and keyboard. The Human Rights Commission is acting like a dog without a bark. It’s response is feeble and more an endorsement of the govt action.The Chairman is a well known Yahapalana supporter, so this is just an eye wash! If all these people had read all the things given in the FB, they would be horrified. Most of our people are using FB for “Opa Doopa” and they have become worried without thinking beyond their personal joy. HRC SL must come out strongly regarding circulation of hatred and rumours – for example ‘Wanda Pethi’. Facebook may have some positive aspects but in the wrong hands can cause irreparable damage. There are so many “Organizations” formed and in active operation to propagate RIGHTS in every corner of the Globe. This “slogan” or “Dharma” has been made very powerful and a “Business Tool” that has been “Invested” upon heavily and made to generate billions, if not trillion of PROFIT by the “Investors” and “Associates” who thrive on making a very comfortable life. The “Facebook” etc. the so called “Social Media” are in the hands of a FEW invisible “Investors” whose only objective is to make money and nothing but WEALTH. Those “Institutions” a few in numbers have no other SOCIAL OBLIGATIONS other than to make money. Those FEW institutions have very cautiously and competently insulated their motives and spread out to the world at large a brand new DHARMA termed RIGHTS as a marketing tool and completely shaded off or blackened the most vital and important aspect of social development called SOCIAL OBLIGATIONS and RESPONSIBILITIES. It has reached such an alarming heights, that no Governments or Civil Society organizations dare speak of SOCIAL OBLIGATIONS and RESPONSIBILITIES. This phenomena is very visible when you read the contents of the letter addressed to the Secretary to the President by the Human Rights Commission produced in the above reporting. Are there any mention of provisions relating to or proposing a MECHANISM to safeguard SOCIAL SECURITY and provide for ACCOUNTABILITY and RESPONSIBILITY in allowing that Dharma of “RIGHTS”? Why it is not provided for? The answer is simple. Such provisions will ERODE into PROFIT making and the BILLION/TRILLION wealth generation for a FEW of the Business Ventures will FAIL. That was the SECRET behind that VISIT to Sri Lanka by the delegation of those “Business Organizations” who manage and administer these social media outlets. 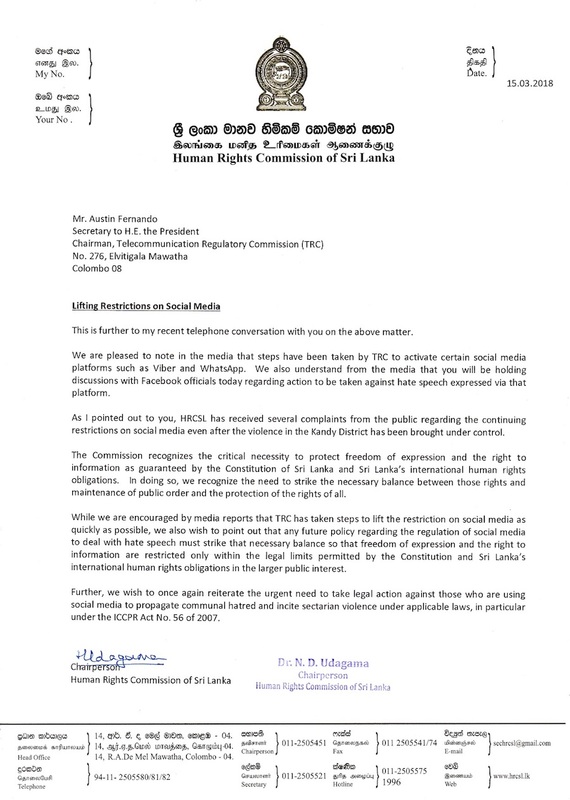 In a way, I am happy that Sri Lanka sent an UNFORGETTABLE and a CONVINCING message to these Social Media Business Institutions that they cannot do things as they DESIRE on their DICTATED TERMS. Madame is a paid coolie of Appe Aanduwa. 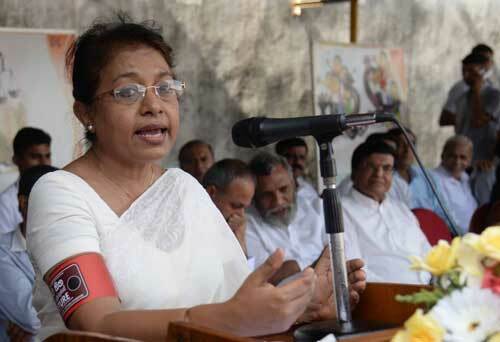 New King fired Dilrukshi, but promoted Madame Deepika to Appe Aanduwa Propaganda Channel Anchorage. She is talking very seriously because UNHRC sitting going on. This the time the dedicated services of madame need most to Appe Aanduwa. Probably Madame did not know the extensive clauses in the Emergency Regulation, which is going extended doing more damage than Facebook ban. We learn the New King’s administration said that Lanakwe benefited by the ban of Facebook. I am not sure if that is only few ministers worked with the Facebook or Common civilians? On the other side Dr.Brian has pointed out the CTA, which was invented replace the PTA extended the “Terrorism” definition as NGOs collecting info and distributing too. Fake madame talking about freedom of expression, but can she explain under what ground assented to that and she never condemned the proposed CTA? We know all about Udagama and herblind support for YAHAPALANAYA. The so called protest from this mob is more an endorsement of govt actions. It opens by saying “We are pleased to note etcetc “ What humbugs. All pandankarayas. We are not interested in your relationship with MR.
A feeble attempt to justify the mega bucks this woman is getting for her support to YAHAPALANAYA. She has no credibility.